Home Opener at Dodd Stadium, Tonight! After two months of training on the box office system, writing articles for the game day program, fielding phone calls for tickets for the 2012 season, working high school and college tournaments – finally – tonight is Opening Day for the team I work for, the Detroit Tigers’ Class-A affiliate, the Connecticut Tigers! I’ve attended many, many opening days over the years, however never from a behind the scenes standpoint. The red, white and blue bunting, the on-field presentations and the excitement of taking my seat at the first game of the season has always been part of the excitement, year in and year out. This year, however, I won’t be sitting in a seat. I’ve been organizing who will be sitting where in which seats through our 6,000 seat stadium. It is seven hours before game time and the staff is working hard, wrapping up the last bit of things that need to be done before Tigers fans show up to the ballpark. The team is returning from the road having split the two games Monday and Tuesday night at Lowell (the Spinners, the Red Sox A affiliate). Tonight Lowell returns the favor of playing ‘opponent’ for the Tigers at Dodd and there should be a great amount of Red Sox fans who reside in Connecticut not quite sure of which team to pull for. The stadium should be packed as it’s Opening Night and we have fireworks immediately following the game. When I toured the stadium in my first meeting with the ballclub, this view below, was one of my favorite. The time between the locker – the getting ready point – and the field – the time to perform part – must be one of the best in sports. Last minute inside jokes exchanged with teammates. Getting your head right for the big game. Settling your nerves before you step in front of thousands. This stretch is the last opportunity to get your head right before heading out to the field and playing for the fans. This shot here is of the tunnel from the visitor’s clubhouse to the visiting team’s dugout. Gotta love the sound of cleats walking through a tunnel, no? The home fans that have their season tickets and their ticket plans and those that have been keeping the box office phone ringing off the hook yesterday, Tuesday and today are really excited for the season to start. You think it’s hard waiting for your team to start up again in April? Try waiting for the team to start up again in June. I’ve been receiving emails from dedicated Connecticut Tigers fans with ‘Go Tigers’ messages and the place is excited about the opener and fireworks for this evening. When the players aren’t staying at their host families’ homes, they are going to be at Dodd Stadium or on the road representing Detroit’s A-ball farm team. Playing at Dodd Stadium is a treat for these guys as the stadium was actually built in 1995 for a AA team, a couple levels ahead of where our short-season A-ball club is on the road to the Show. So the stadium is bigger, the amenities are nicer and overall, the experience playing here is greater compared to a lot of the teams they will be facing this season. 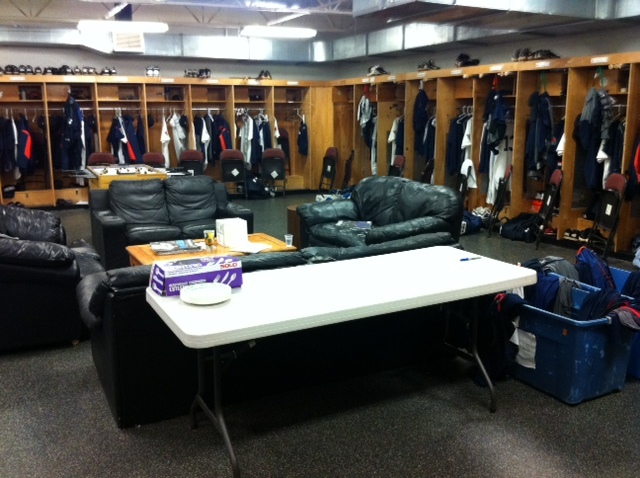 Here is a shot of the home clubhouse. When I saw it for the first time my first thought was ‘Moneyball’ and that the set dressers on that film did an amazing job. I could picture Brad Pitt taking a bat and making a statement in the middle of the locker room as it looked just like the type depicted on film. In about an hour from now the team will take batting practice and get ready to play their first professional home game. The stadium looks great, the box office is rocking and I’m excited to have a few thousand fans here tonight enjoying a night of Connecticut Tigers baseball (and of course reading my writing in the Game Day program, while watching the game). Game time is in four and a half hours and then fireworks afterwards. It’s been a fun two months leading up to the season but tonight it really gets fun. The home team is finally here and we could be watching future major leaguers. Fire up the MLB.TV for my Cubs please. The CT Tigers will be playing on the big field here at the stadium, but my Cubs will be playing on the little screen here in the box office. I played at the dodd stadium last month and the field manager told. That there were no clubhouses at the end of the tunnel…..
← Happy Father’s Day, #Cubs Fans!